What really happens at dinnertime? What are your biggest challenges? Your proudest triumphs? Ragú – that pasta sauce we all know and love – is calling on moms to share their stories! As a Ragú ‘Mom’s the Word on Dinner’ ambassador, over the next few months, I’ll be doing just that – sharing with you what our dinnertime is like, hosting a couple of Ragu-sponsored giveaways, and more! How do you describe dinner in one word? This question really makes you think, doesn’t it? My first thought was that I’d have to agree with the first mom in the video – chaos! But… no. It’s not always that way. Or at least it’s only chaotic for the first few minutes. Joy. That’s how I’d describe dinnertime. Besides playtime, it’s probably the happiest part of our day. We love to eat, that’s for sure, but the happiness doesn’t always come from the food itself, but more from the time spent at the table with family! Satisfaction also comes to mind. The satisfaction that comes from my kids’ smiling faces. The satisfaction that comes from my husband complimenting my cooking. The satisfaction that comes from knowing that I made time in my busy day to cook a healthy meal, having so many other sometimes more convenient options available. Now it’s your turn! How would you describe dinner in one word? 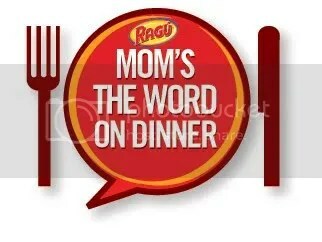 Disclosure: This post was created in connection with my appointment as an Ambassador in the Ragú® Mom’s the Word on Dinner Program. Visit www.facebook.com/ragusauce to join the conversation.